STAR WARS MEETS JURASSIC PARK. A US space probe discovers a 66-million-year-old derelict outpost on the moon, triggering an alien invasion when the owners of the moon base return to claim their home worldour world! As the military forces of the world reel under relentless attacks, two unlikely heroes find themselves at the center of the action where the invaders’ lost city lies buried under a mountain. 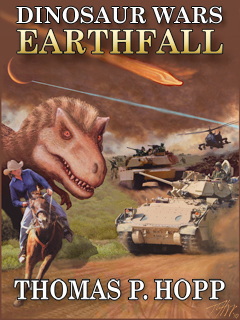 Yellowstone wildlife biologist Chase Armstrong and Montana rancher’s daughter Kit Daniels survive attacks by T Rex and Utahraptors only to find themselves trapped in underground catacombs where human-sized intelligent dinosaurs are preparing mankind’s downfall. As battles rage, this young couple becomes humanity’s last hope. This action-adventure story is suitable for all ages and both genders. DINOSAUR WARS: EARTHFALL brings the colossal beasts of the past to life again, pitted against human heroes like Victor Suarez, captain of earth's last operational tank corps, and cantankerous old Professor Ogilvey, who struggles to understand living dinosaurs whose fossil bones he had been excavating. Meet Gar the Kra, an invader who befriends his human foes, and Oogon, the bloodthirsty Kra warlord who intends to show us no mercy. NOW HUMANS ARE THE ENDANGERED SPECIES! Also available in Paperback at a reduced price: Amazon, Barnes&Noble, and other booksellers.